Peg-interferon and ribavirine therapy is promising for hepatitis C virus positive patients; however thrombocytopenia as its adverse event limits the treatment. 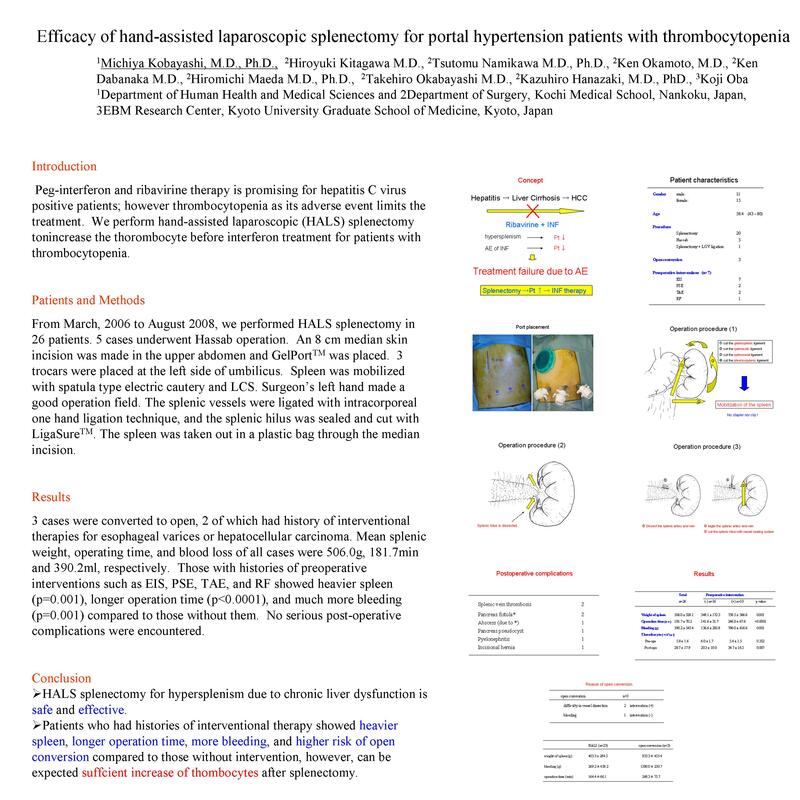 We perform hand-assisted laparoscopic (HALS) splenectomy tonincrease the thorombocyte before interferon treatment for patients with thrombocytopenia. From March, 2006 to August 2008, we performed HALS splenectomy in 26 patients. 5 cases underwent Hassab operation. An 8 cm median skin incision was made in the upper abdomen and GelPortTM was placed. 3 trocars were placed at the left side of umbilicus. Spleen was mobilized with spatula type electric cautery and LCS. Surgeonfs left hand made a good operation field. The splenic vessels were ligated with intracorporeal one hand ligation technique, and the splenic hilus was sealed and cut with LigaSureTM. The spleen was taken out in a plastic bag through the median incision.